Summary: The County of Maramureş is one of the northernmost areas of Romania, just south of the Ukrainian border. The modern administrative county of Maramureş is comprised of three “countries” (ţări) and two zones: the Country of Maramureş, the Country of Lăpuş, the Country of Chioar, the Zone of Codru and the Zone of Baia Mare-Baia Sprie. Out of these five, the Country of Maramureş is the largest, covering about one half of the total surface area of the administrative county. To the north is the Ukraine, beyond the natural border formed by the River Tisa. To the east is Suceava county, to the south-southeast Bistriţa-Năsăud county, to the south Cluj. In 2003, there were 509,534 inhabitants, out of which 52.5% lived in urban environments and 46.5% in rural areas. The capital city of the county is Baia Mare with 137,318 inhabitants, while other municipalities are Sighetu Marmaţiei, Târgu Lăpuş and Cavnic, and towns are Seini, Baia Sprie, Borşa and Vişeu de Sus. Winters are very long and as Maramureş is surrounded by mountains, it is quite hard to reach it during the cold season: the roads rising to the mountain passes are mostly closed between November and April.It rains a lot in Maramureş, especially along the valley of the Iza River, due to the southwesterly winds that are caught by the ring of high mountains. In the valleys the yearly precipitation is about 790-820 mm, and in the mountains around 1000-1390 mm. Vişeu is the wettest zone in Maramureş. There are about 140 rainy days in a year, while there are only about 30 days in a year when it snows. The rains are most common at the beginning of spring, as well as during June and September. The month with the heaviest snowfalls is January. 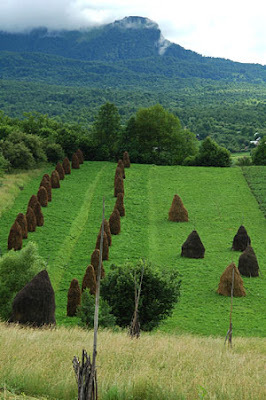 The relief of Maramureş is varied, the altitudes ranging from 200 to 2,300 m above sea level. The land is 43% mountains, 30% hills and plateaux, and 27% flatlands and meadows. The views from the hilltops embrace beautiful green valleys, meandering rivers and snowtopped mountain peaks. 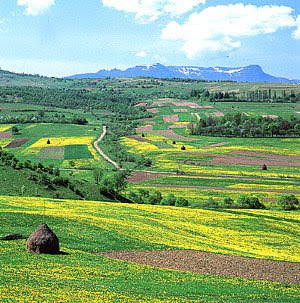 Mountains surround the Country of Maramureş: the Maramureş Mountains are to the north-northeast, the Prislop Pass to the east, the Rodna Mountains to the southeast, the Țibleş Mountains to the south, the Lăpuş Mountains to the southwest and the Gutâi and Igniş Mountains to the west. It is here that the Eastern Carpathians - the 300 km long natural divide between Moldavia and Transylvania - reach their highest altitude with Mount Pietrosu (2302 m) in the Rodna Mountains. The single easy point of access into the area is around the town of Sighetu Marmaţiei where the valley of River Tisa forms a wide plain.The Gutâi and the Tibleş Mountains form a part of the longest volcanic chain in Europe (600 km long). The volcanoes are no longer active, but it is possible to see astonishing calderas at the height of 1,000-1,830 m.
Two river systems - the Tisa and the Someş - drain the county. To the north, the Tisa drains the rivers that flow down the surrounding mountains and across the Maramureş basin: Vişeu, with its main tributaries Ruscova and Vaser, and Iza with its main tributaries Mara and Cosău. Săpânţa is another branch of the Tisa, situated on the western borders of Maramureş, but worth mentioning for its two waterfalls of more than 12 m high. The Someş drains the rivers in the southern part of the county: Lăpuş and Sălaj. The River Tisa’s sources are in the Ukraine. 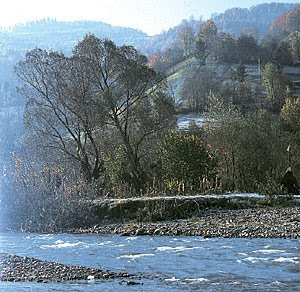 From its joining with the River Vişeu in the east to the village of Teceu Mic in the west, the Tisa marks the frontier of Romania with the Ukraine. The valley of Tisa from Vişeu to the village of Bocicoiu Mare is so narrow that the railway is hardly able to carve out its path between the mountain and the riverbed. The view from the train is very beautiful, this being one of the most impressive landscapes in Romania. 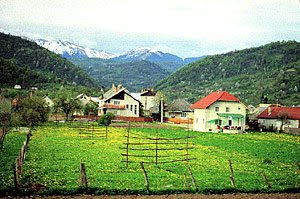 Maramureş is characterized by its rolling hills. Thick forests of oak, beech and pine cover many of them, while orchards of apple, plum and cherry trees dominate the surroundings of villages. A rich variety of flora thrives in the hills and among the network of rivers and streams that covers the region. The Maramureş Mountains in the north are among the wildest areas in Eastern Europe, and bears, deer, wolves and lynxes live in the virgin beech forests. The mountains are dotted with beautiful landscapes, small lakes, caves and very interesting and rare flora. 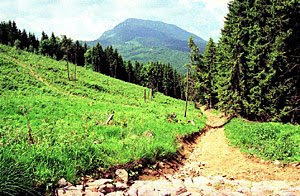 The Rodna Mountains, the highest not only in the region of Maramureş but in the long ridge of the Eastern Carpathians, are capped with snow all through the year. These mountains are among the best-preserved natural regions in Europe. In the Rodna National Park is the Pietrosu Mare Biosphere Reserve, which is included in the UNESCO World Heritage List. The park preserves untouched ecological systems, with many very rare flora and fauna species, such as Lychnis nivalis, a small flower found nowhere else in the world. Here one can see waterfalls, e.g. Cailor Waterfall, which is over 80 metres high, and more than 20 stunningly beautiful glacier lakes, such as Lakes Iezer and Lala. From Vişeu de Sus it is possible to go up to the wild mountains in a steam engine train (Mocanița), built in 1953. The tracks run for 41 kilometres along the Vaser River up to hamlet of Comanu, and its lumberjack camps, near the Ukrainian border. The Vaser Valley is also a good location for kayaking enthusiasts. The Maramureş Mountains are in general considered among the best places in the region for hiking, paragliding, mountain climbing, cave exploring or bird-watching and photo-safaris.